Settle in with a Knickerbocker and feast your eyes on the delicious dishes of Four Seasons Los Angeles Executive Chef Ashley James, who keeps hotel guests and the YH Studio team alike well-fed! 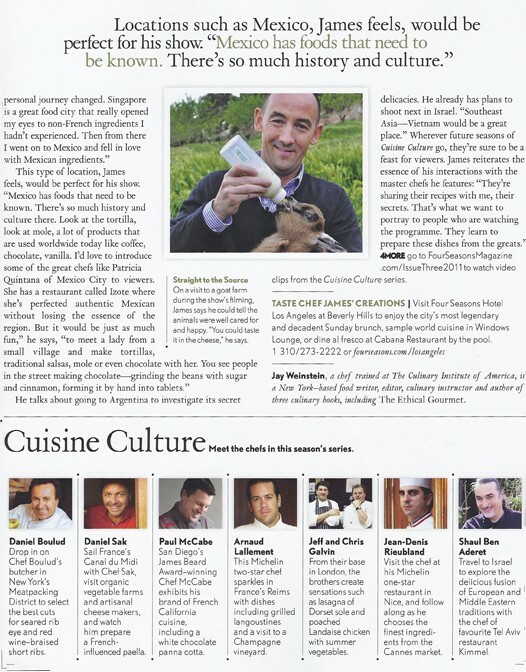 In addition to debuting the hotel's StrEAT menu, Chef Ashley is also debuting a TV show on PBS called "Cuisine Culture." Next time you're at the Four Seasons, be sure to try his exclusive Young Hollywood Salad! Hosted by R.J. Williams. MONDAY, SEPTEMBER 26, 2011 AT 8:51 A.M.
You've heard of the casting couch, how about the casting kitchen? Fresh from behind the stove, L.A. chefs, with their proximity to TV producers, seem to have a lock on new TV food shows this year. Ludo and Krissy Lefebvre's Ludo Bites America entertained on Sundance Channel this summer; chef Eric Greenspan is demolishing kitchens (and then fixing them up, of course) for A&E's Fix this Kitchen; and on PBS, Cuisine Culture recently debuted hosted by the Four Seasons at Beverly Hill's executive chef Ashley James. In the series, the amiable British-born chef, who was cast in part because he speaks French, goes into the kitchens of master chefs like Daniel Boulud in New York and Guy Savoy in Las Vegas. There's a delicious emphasis on France: James floats down a canal in the Midi on chef Daniel Sak's refurbished barge and visits the famed Hotel Le Negresco in Nice. And he detours to Israel plus Del Mar, Calif. where he meets up with chef Paul Mc Cabe of L'Auberge del Mar's Kitchen 1540. "The best thing is that it was a lot of fun," says James of the whirlwind 13-show shooting schedule. 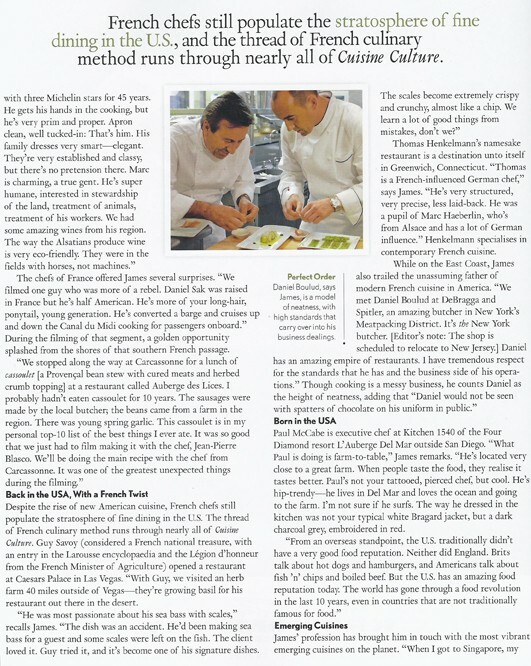 "Sharing passion, flavors and lots of great wine in the kitchens of such chefs was an honor," he adds. He found the fancier or more well known the chef, the simpler and more direct was their cooking. On the Tango barge he savored a seafood paella with Chef Daniel Sak -- who has transformed a 1930s canal barge into an exquisite cruising inn -- and a goat's milk ice cream enhanced with fried Acacia flowers. Cuisine Culture airs on Saturdays at 4:30 on local PBS affiliates KLCS and KVCR (check local listings) and across the country on more than 55 other PBS affiliates. 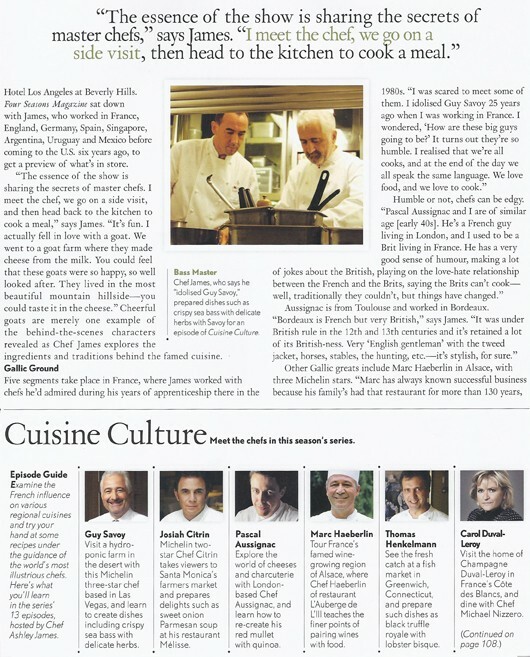 James found much inspiration interviewing and cooking with such diverse and talented chefs. 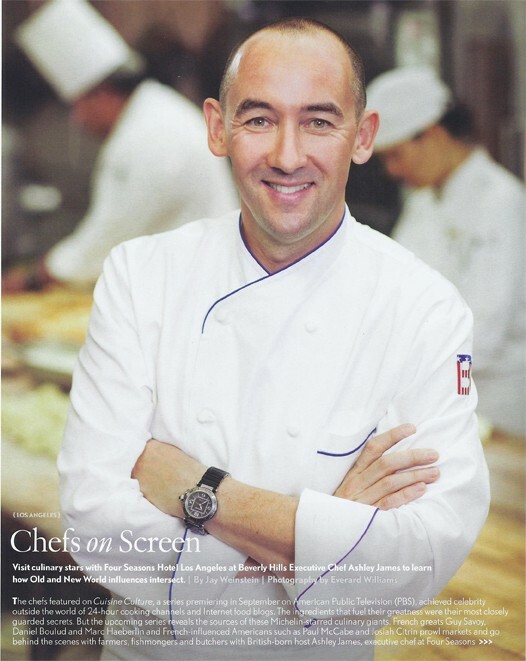 A seasoned chef himself, he's worked at Four Seasons' hotels in Argentina, Mexico and Singapore. He recently revamped the bar menu at theFour Seasons Windows Lounge to reflect those global experiences adding a "StreEAT" selection of small plates. From a jazzy Gazpacho salad of jicama, watermelon, papaya and pineapple to Belgian fries with house-made mayonnaise, James offers street food made with quality ingredients -- some harvested from the hotel's on-site garden. Executive Chef Ashley James with Host Wendy Burch! 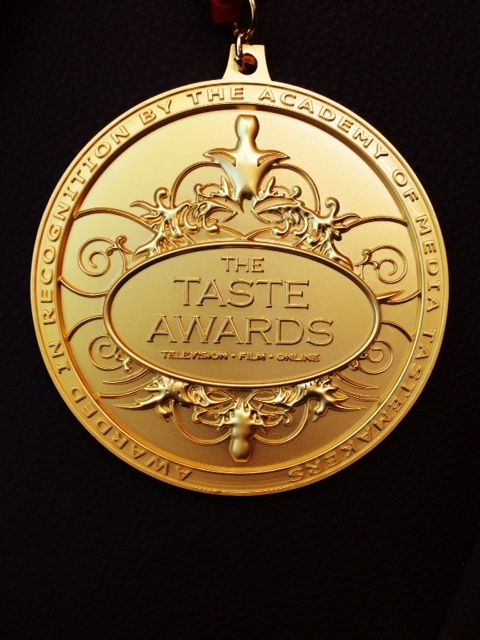 The TASTE AWARDS are the highest awards for theLifestyle Entertainment Broadcast Industry. 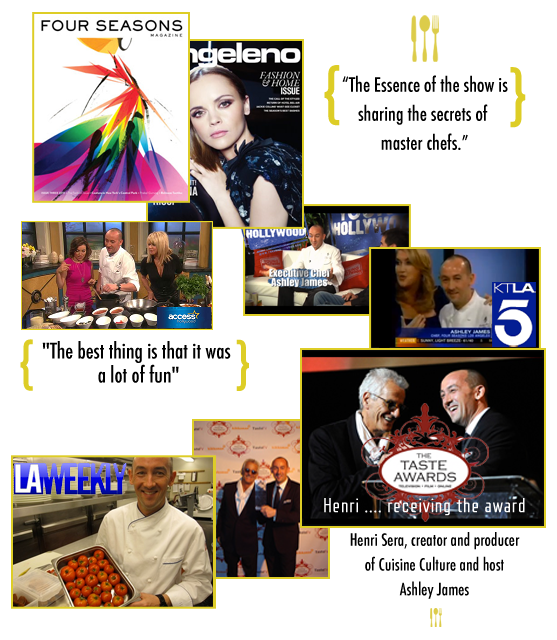 Also known as the Tasty Awards, they are the premier broadcast awards show celebrating the year’s best achievements in Food, Fashion, Home and Lifestyleprograms on Television, in Film, Online, in Apps, and on Radio.